The Institute Astronomical Observatory of the Adam Mickiewicz University in Pozna� welcomes all participants to the 8-th Meteoroids 2013 Conference. 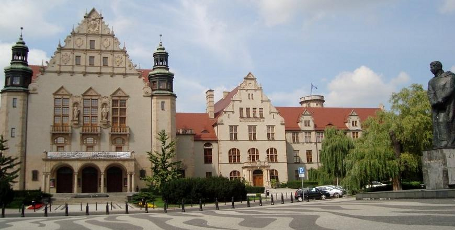 The meeting will take place at the Collegium Minus - University of Adam Mickiewicz in Pozna�, Poland from 26 - 30 August 2013. As with the highly successful the Meteoroids 2010 Conference, it provides an attractive platform to exchange and present results amongst the scientist from all the World. The Meteoroids 2013 will have an interactive style, with a mix of talks and posters, which will cover the wide scope of meteor astronomy, meteoritics and astrobiology. While in general the summers in Pozna� are warm, with temperatures mainly staying in the mid to high 20s, it's best to bring a jacket or warm sweater even in late August, because the nights can get pretty chilly, and a freak thunderstorm can always put a damper on your outdoor plans if you don't have an umbrella. The current weather forecast you can check here. Travelling to Poland is easy, however the documents you need vary depending on where you are from. Very often foreigners are not required to be in possession of a visa when entering Poland for less than 90 days. In opposite case must request a visa at the�Polish consulate, you will need a personal invitation letter. For details, please see section Visa Requirements & Letter of Invitation. The organizers cannot accept liability for personal accident, loss or damage to private property, which may be incurred as a result of the participation in the Meteoroids 2013 conference. Participants are advised to arrange appropriate insurance cover. This should extend not only to travel but also to cancellation costs. Pozna� is quite safe city, but at the places like railway station, at the airport or in a tram, the pickpocketers and muggers are active. Please pay an attention to where and how you're carrying your wallet, bag or backpack, and this will spare you the ordeal of having documents, money, photo camera or your notebook stolen. Please keep an eye on those items while you're walking in the street or sitting in public places. Don't leave unguarded your sensitive items on the floor or on a chair while drinking something at a bar or on a terrace. You don't need to get obsessed with that, just a general care. In case of emergency, you can call the central alarm number 112 (by mobile phone), which is free from any phone. Other numbers are: Health Emergency: 999 , Police: 997 , Fire Brigade: 998. Voltage in Poland is 220-240 V/ 50 Hz. Primary Socket Type: Europlug, Schuko. For details see here. The official currency in Poland is the Polish zloty (PLN): 1 zloty = 100 grosz. Banknotes come in 200, 100, 50, 20 and 10 zloty denominations. Coins are 5, 2 and 1 zloty, and 50, 20, 10, 5, 2 and 1 grosz. More info here. Money can be exchanged in banks and money exchange offices without commission. The current average conversion rates among the PLN and other currencies are given here. Information about public transport in Pozna� you can find here. If you prefer taxi, the cheapest and the safest way is to call +48 61 8222 222 or +48 61 8222 333. A taxi ride from the airport to the center (~6 km) costs 25-35 PLN (~7-9 EUR).